Our large 55" x 70" Ultra Plush TV Blanket is perfect to snuggle up in on those Winter nights. With built in arms and a front pocket it is a great gift. 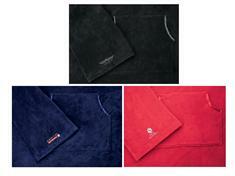 Available in 3 material colors, it is made of Ultra lush Fleece. Includes up to 5,000 stiches and 15 colors of embroidery.